“Mott the Who?” … “What the Hoople?” … “Mouser Hoop…” … ah, Mott the Hoople … a band that would sculpt a history as sensational as its moniker. Oozing style, attitude and wild unpredictability, they believed they could … they almost didn’t … but they did! In the Seventies, there were rock ‘n’ roll bands and there was Mott the Hoople. Adored by a cult following, Mott was different as their focal point, Ian Hunter, oozed image and was a creative force. Hunter combined homage, honesty and killer hooks in many incredible songs, was one of the most inventive and incendiary writers of the Seventies and captured the attention of countless bands and singers. Mott the Hoople recorded four albums at Island Records – Mott the Hoople, Mad Shadows, Wildlife and Brain Capers … the latter a record that would give credence to the “Godfather of Punk” and “Precursors-of-punk” claims subsequently levelled at Ian and the band. David Bowie, was a secret fan of Mott and an admirer of Hunter’s commanding on-stage persona, and he offered them a classic song … ‘All the Young Dudes’ … which swaggered to No.3 in the UK singles chart and propelled the band towards a mainstream audience. 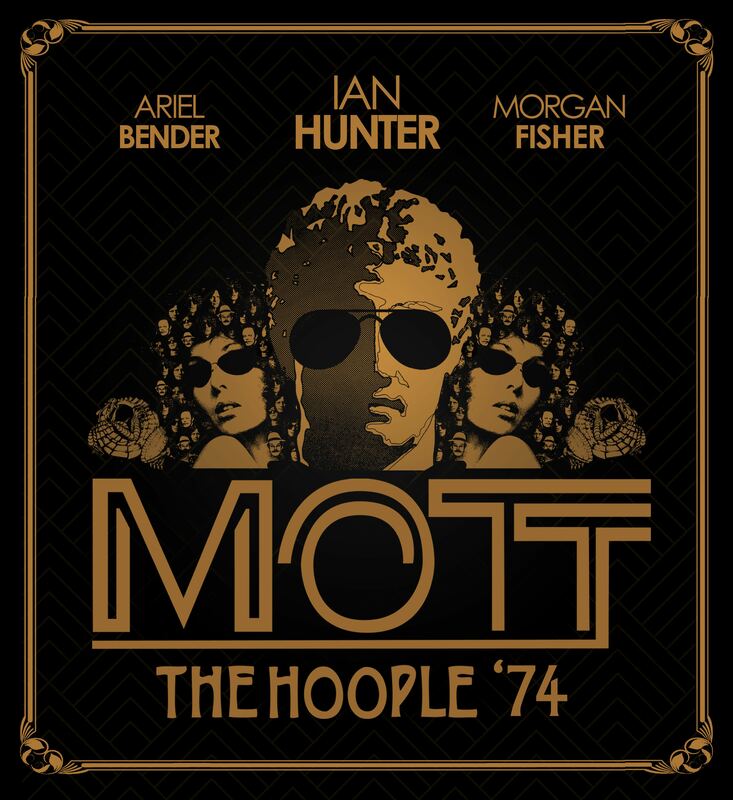 Mott the Hoople was re-born and Hunter felt rejuvenated, writing most of the songs for Mott which is still regarded as a classic album of the Seventies chronicling the trials, tribulations, inspirations and desperation of rock and roll. Sell-out Mott tours were punctuated by a string of successful singles penned by Ian … ‘Honaloochie Boogie’ (No.12), ‘All the Way from Memphis’ (No.10), ‘Roll Away the Stone’ (No.8) and ‘The Golden Age of Rock ‘n’ Roll’ (No.16) … while Hunter blazed across the front pages of the world’s music press. The band’s popularity was soaring but Verden Allen and Mick Ralphs left for pastures new and were replaced by Morgan Fisher and Luther Grosvenor, who adopted the name Ariel Bender … rock’s greatest alter-ego. Ian composed some fearsome and observant classics for their final studio album, The Hoople, which included the highly-charged ‘Crash Street Kidds’ and the dramatic ‘Marionette’ … Hunter’s “five-minute opera”, described as a nervous breakdown on record, and an influence on Queen’s ‘Bohemian Rhapsody’ and the David Essex movie Stardust. ‘Ian Hunter … even his name reeks of rock royalty. The swagger! The shades! Ian Hunter’s book Diary of a Rock ‘n’ Roll Star was also published in 1974. Filled with wise observations about the highs, lows and emptiness of stardom, it was subsequently cherished as a “bible” by John Taylor (Duran Duran), Billy Duffy (The Cult), Jim Kehr (Simple Minds) and Johnnie Depp … and was ultimately acclaimed by Q magazine as “the greatest music book ever written”. Since 1975 Ian Hunter has crafted an astonishing solo career with Ian Hunter, All-American Alien Boy, You’re Never Alone with a Schizophrenic, Rant and the recent Top 40 album, Fingers Crossed … but, in 2019, ‘The Class of 74’ is back! Mott the Hoople will play a series of British and American concerts this year, including a show at New York’s Beacon Theatre and two London gigs. “Tickets for the fantasy” … focused on The Hoople, Mott the Hoople Live and the infamous Uris Theatre Broadway concerts … are “a must” in 2019, considering the band’s amazing European festival appearances in 2018. Hey Dudes … Dandies … and Crash Street Kidds … join the roster for ‘The Class of 74’ … NOW!